Kupa's Jess Alexander demos at Premiere Orlando 2018. Held June 1-3, Premiere Orlando will feature even more opportunities for education, networking, and shopping. 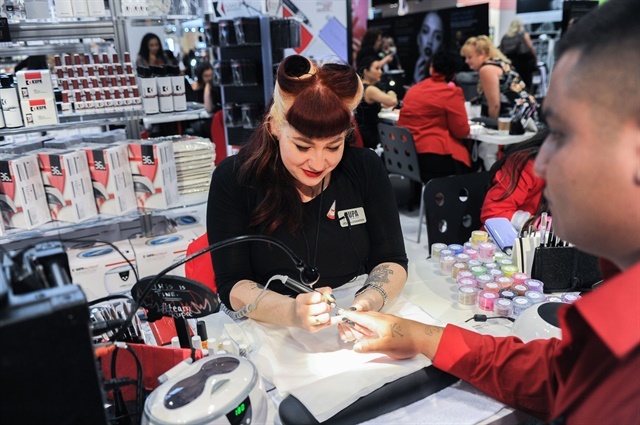 Last year, more than 59,750 beauty professionals attended the show with more than 850 exhibitors across the 7.3-acre exhibit floor. This year, the show will host over 650 educational classes with many new additions. Network with thousands of beauty professionals from all 50 states and across the globe and explore the exhibit floor to get the products and tools you need. NAILS Next Top Nail Artist Finale Social will be held June 1 at the show. The winner of NTNA will be announced, and attendees will have opportunities to network, see demos, win prizes, and more. The first 500 attendees to enter the party will receive swag bags. Premiere Orlando will feature nail education from many companies including CND, Tammy Taylor, Young Nails, Cuccio, Famous Names, LeChat, Light Elegance, Akzentz, Tony Ly, Precision Nails, Maisie Dunbar, Gelish, Artistic Nail Design, Entity Beauty, Erica’s ATA, Bio Sculpture, Morgan Taylor, The Nailscape, Backscratchers, Gel II, ProFiles, KUPA, Nail Labo, Wildflowers Nail Academy, Christrio, North American School of Podology, Odyssey Nail Systems, Jenny Bui, Aprés Nails, Atwood Industries, Nitro Nail System, Mia Secret, Revel Nail, Footlogix, Rejuvenate Disinfectants, Designer Nail Products, Centre for Beauty, Voesh, The Nique Collection, IBD, EzFlow, Premium Nails, and NuRevolution. Nailympia competitions will be held with categories including Gel Tip Overlay, L&P Acrylic Sculpture, Joy of Nails With Bling, Reality Nails, Mixed Boxed Media, Runway, Stiletto Nails, Fantasy Complete Look, and Soak-Off Gel Manicure. For more information, visit www.premiereorlandoshow.biz.